I consider my life to be a novel with God, in which I get to write another page every day, filled with chapters from every season of life. It’s an honest reflection of where I am in my relationship with God and how God is always there even when I’m blind to His presence. This story is full of twists and turns. Some pages are filled with pure light, where God’s presence is apparent and powerful in my life. Some are filled with darkness, where I feel alone, isolated from God and the world. Some pages are messy and torn, where life is filled with conflict and people get hurt. Some pages are crisp and clean, where true, blissful community is experienced the way God intended it to be. It seems that over the past few years, I’ve had more of the dark and messy days than the light and clean ones. I began to wallow in my dark and lonely days, letting myself become a victim to pain and rejection. I drowned in depression and anxiety, hating the way I viewed myself. I became distant from others and from God. Isolation, darkness, and despair were ravaging inside of me most days, but I put on a smile. I cracked a joke. I began to strategize how I would hide my hurt. I let people think I was fine. I kept my distance from people, which only created conflict, hurt, and insecurity in my relationships. In these dark chapters of life, I still pursued God, but I became helpless in my pursuits. I didn’t know why I was distant or why I couldn’t connect with people. I didn’t know why every encounter with a friend was replayed in my head, twisting every one of their actions into motives of rejection and abandonment. Every night, at the end of my page for the day, I begged God for answers. “God—just tell me what is wrong with me,” I pleaded. And, in my despair, God reminded me that this novel is a love story. This summer there were a series of sermons, articles, and books that I encountered in which I felt that God was telling me to keep my eyes fixed on Him, walking to the cross daily, and not to live out of the wounds of my past, where the brokenness of this world had left me in pain. So I began to take a dive into the wounds of my past, journeying back to my adolescence to find the cause of my insecurity. While our adolescent years may seem trivial, my middle school and high school experiences left me broken in many ways, filled with heart-breaking failed relationships. Friendships where I felt myself giving everything and receiving nothing, where I was seeking something meaningful but coming up empty. I quickly realized that these broken friendships left scars in my life, causing me to question my self-worth and ability to love others well, creating deep insecurities that are still manifested in my life today. These broken relationships are what initially turned me towards a relationship with Jesus in high school. In these moments, standing in the shambles of the friendships in which I had placed my worth, I found Jesus standing next to me, holding out His hand. He felt the depth of my brokenness, and He held out His hand to comfort me. So in 2011, our love story began. But until this past summer, even while placing my worth in God, I was walking around with Band-Aids over the wounds of my past. With these wounds, I guarded myself from God and others so that I wouldn’t get hurt again, and I didn’t allow God heal my insecurities. And some days, my teenage-born insecurities became so apparent that they outshone God’s presence in my life. This revelation was astounding. But it put me on a path of restoration. And this path winds through a new chapter in my story. Its pages are filled with healing and vulnerability; in which I expose myself to Jesus and the people around me little by little. My story is now filtered through a lens of humility and grace, a scope where I can be honest about who I am and let God be God. Being vulnerable has allowed me to see how deep the pains of my rejection are. But the deeper I discover my pain, the more I discover how deep my Father’s love is for me. There are still some days where the ink is smudged, others are filled with typos and mistakes, and some are torn and full of shame. But in each bad day, God empowers me. He takes the pages ruined by the brokenness of this world, and He restores them. He tapes up the torn pages and whites out the typos, all while armoring me with His grace and love. Each day, I make my brokenness known to him, and he makes me new. So our story continues, day by day, and His mercy fills my life with chapters of love. 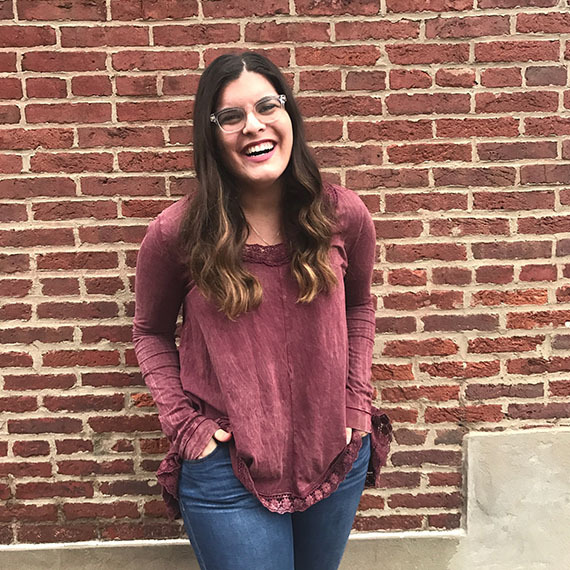 —Ohio native Leah Shaheen is a senior at Duquesne University. She will be receiving her Bachelor’s Degree in Health Sciences with minors in Spanish and Psychology in May 2017, and will receive her Master’s in speech-language pathology in August 2018.